My favorite night-time activities in New York are rather tame…dinner and a show. We treated ourselves two nights in a row. On Friday night we saw Waitress which was quite clever and funny! We really enjoyed the acting, the set, and all the decorations in the theater entrance. It was a very uplifting performance. Dear Evan Hansen, which is also well done, on the other hand was quite depressing. A tony winner and popular, I was excited to see it, but the topic of teen suicide was somewhat depressing. I prefer feeling uplifted after a show, so despite the hype and tickets twice as expensive as The Waitress, I liked The Waitress better. Of course, no matter what the topic, theater in New York City always features outstanding talent. The singing, dancing and sets are always a treat. Food in New York City is also a pleasure. Our meals did not disappoint. We reserved a table at District Social (pre-theater) on Friday night. The hostess escorted us through the packed, loud bar to the upstairs dark, dining area. My old-lady eye’s required the flash light on my phone to read the menu, but the atmosphere and dinner were excellent. Our Saturday evening meal was at Bea in Hell’s Kitchen. This popular eatery serves tapa style plates. The service as fast and the food was excellent. We shared pork dumplings, tuna tar guacamole, grilled scallops, and a flourless chocolate cake (we had to have dessert at least once!). Both restaurants were within walking distance of the shows, but far enough away from Time’s Square that they weren’t completely touristy! The weather was far from cooperative on Saturday with the outskirts of a hurricane catching Manhattan. With cool temperatures and constant sprinkles, we took advantage of our hop-on, hop-off bus ticket which was included in our Dreamtrip. The $48, 24-hour pass on the Grayline City Sights included 4 different routes, access to the hop-on, hop-off ferry, and free entry to the New York Historical Society. What better way to traipse around New York City and hear its history. We boarded at a downtown location as that was closest to our hotel and took it to Chinatown and Little Italy. New York City’s Chinatown is the largest population of Chinese outside of China. We passed by fish markets, Chinese specialty stores, and some booth selling “knock-off” items before we eventually reached Mulberry Street which is lined with Italian Restaurants. It’s a sin to travel to New York City and not try some Italian food, so we stopped in at La Nonna and had some pasta. Kristin ordered clam linguini while I picked chicken and mushroom penne. After savoring a nice meal, we popped into a coffee shop to warm our insides before finding some fresh ravioli to bring home as we headed back to the Hop-On, Hop-Off Bus which we took to midtown. We visited St. Patrick’s Cathedral during a wedding ceremony and arrived at Rockfeller Center while crews prepared the ice rink for the Christmas season! After a day bouncing around the lower half of Manhattan (50th Street and South), we returned to the Conrad for a quick change to go to our aforementioned dinner and our show. The next morning, we started out at One World Observatory. Our Dreamtrip included the $44 ticket to the top. After about an hour at the Observatory, we ventured up to Central Park. The improved weather lent itself to a lovely morning for a walk in the park. 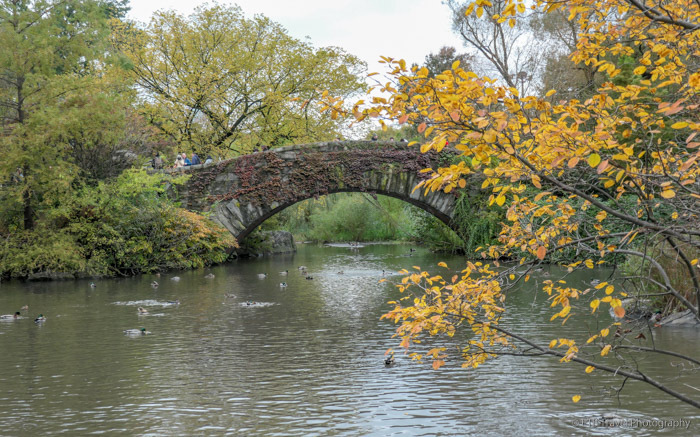 We joined countless others enjoying nature in the center of New York City. Our aimless route took us from West 70th Street, past the zoo, and all the way down to the southeast corner of the park, where we began our search for a lunch spot a few blocks off the beaten path. We lucked out and snagged the last table at Brooklyn Diner where we ordered enormous sandwiches. Though the skies were still sunny, the wind picked up causing the afternoon temperatures to feel quite cold. As such, we looked for indoor entertainment. After discovering the The Ed Sullivan Theater wasn’t open, we altered course and turned toward Rockefeller Center. We were so lucky! A 1.5 hour tour of the Radio City Music Hall was starting in ten minutes. Without knowing the price which turned out to be $30, we were sold. An enthusiastic tour guide led our small group through the 1930’s art deco theater that just underwent a massive renovation to bring it back to its original state. Rectangles of instruments decorate the lobby carpet. The mural above the grand staircase is the size of an indoor tennis court. Dim lights and black decor blanket the lower lobby. Originally this was in order to subdue the patrons waiting for the next show. The original shows included a movie with the Rockettes dancing afterward to the theme of the movie. With the competition of TV and regular movie theaters, however, interest in these featured performances dwindled. As such, in the 1970’s the theater faced demolition and was saved after receiving a historical designation with one week to spare. Now, of course it features concerts, award shows and The Christmas Spectacular with the Rockettes. Along with the public area, we toured backstage hallways lined with photos of famous performers, costume rooms and lounges. We even met a Rockette. Interestingly, the Rockettes started out in St. Louis a few years before Radio City Hall was ever built! We also learned that Rockettes must be at least 18 years old, must stand between 5’6” and 5’10” in order to give the illusion of the same height on stage, and have to try out every single year. The fact I found most interesting, however, is 13 motors operated the 14,000 pound curtain! The very first “act” at New York’s famous Radio City Music Hall was a 15-minute display of moving the curtain! I also kind of liked the original hand dryers operated by foot pedals! Having already been to a Rockettes show, I wasn’t sure I’d enjoy the tour, but having this 6,000 seat theater to ourselves was a pleasure! Kristin had an early evening train, I had an evening flight, so our quick visit came to an end. We didn’t even wind up using the $37 Empire State Building passes also included in our Dreamtrip. We figured one Observatory deck was enough, but we sure enjoyed quite a package deal. New York City is my favorite city in the world and I already want to go back! Click HERE for an offline GPS guided article on the GPSMyCity Travel App. A Wonderful Weekend in NYC!! Definitely a packed full weekend! Well done! Definitely played the tourist card! Great post! I loved your photos!